Hematology/Oncology Nurses, often abbreviated to Heme/Onc Nurses are those individuals who work with patient populations undergoing both solid and bloodborne cancer diagnoses, treatment and remission. Searching for open internal positions online at local hospitals is the best approach to finding a position. New graduate nurses will need to complete an internship program which involves both a didactic component as well as working alongside a nurse-preceptor as part of the interdisciplinary team to learn the role. Experienced nurses coming from a different specialty will have similar training. Training may be tailored to meet their didactic and practical needs. A Bachelor of Science in Nursing degree is considered to be competitive for applying to an Oncology Nursing position, however at this time, nurses with an Associate's Degree in Nursing may apply as well. Specializing in oncology and cancer care requires the nurse to take on additional coursework and clinical training; there are also additional continuing education courses and contact hours that are specifically focused on various aspects of the oncology specialization. After working as a Heme/Onc nurse for some time, the nurse becomes eligible to take exams and become certified in the specialty. The Oncology Certified Nurse (OCN) exam requires 1000 hours of oncology RN experience as well as 1 year as a RN and 10 contact hours in the field of oncology. The certification is valid for 4 years then requires renewal. For nurses who administer chemotherapy, earning the ONS/ONCC Chemotherapy Biotherapy Certificate is a great way to demonstrate expertise and dedication to nursing. Eligibility includes administering chemotherapy for at least 1 year and at least once a month and this certification provides 15 contact hours. Since the advent of advanced cancer treatment, mid-sized to large hospital campuses often have an oncology team to manage patient diagnoses and treatment plans. 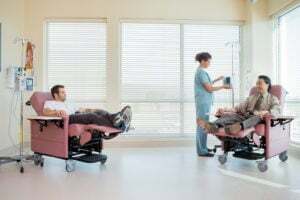 For specific or rare kinds of cancer, patients may travel to prestigious hospitals and teaching facilities for innovative treatments; these facilities are magnets for nurses who feel called to the forefront of treatment for those with cancer. The hematology/oncology, or Heme/Onc nurse provides both curative and palliative treatments for all types of cancer and blood disorders. The nurse is responsible for quickly assessing and providing the appropriate interventions. The Heme/Onc nurse is able to tolerate a wide variety of emotions throughout the day and enjoys the challenge of caring for very sick as well as stable patient populations. Administering chemotherapy is common as well as assessing for complications from this therapy. Working with the interdisciplinary team to develop a plan of care is the cornerstone of the role. What Are the Roles & Duties of an Oncology Nurse? Given the advancing age of our population and the argument that we live in an increasingly carcinogenic world, the field of oncology is forecast to expand faster than national averages over the next 10 years or so. There are several opportunities for nurses to pursue oncology specialist work to meet this need. The average salary for a Heme/Onc RN is $67,197 with a national range of $45,698 - $89,644. These salary figures depend on location and skills, nursing certification and degree level.